Springtime at Reid Travel is a time for planning. As flowers blossom in April, so do our thoughts about family travel ideas. 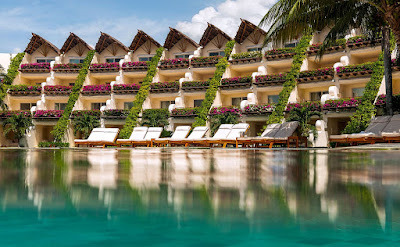 Summer is not far away so this week we share with you a place that will appeal to almost any family as it has something for everyone and it’s really close to home—Grand Velas Riviera Maya, a Mexico beach resort in Playa Del Carmen. Imagine 85 magnificent acres surrounded by the Caribbean Sea and lush jungle. The resort features elegant suites with luxurious amenities, many categories of room/suite styles, fine dining in a variety of restaurants, 24-hour in-suite dining, the famous Kid’s Club and many more amenities which are included in the all-inclusive program. It boasts a family-friendly section as well as an area exclusively for adults and guests over 12 years old. 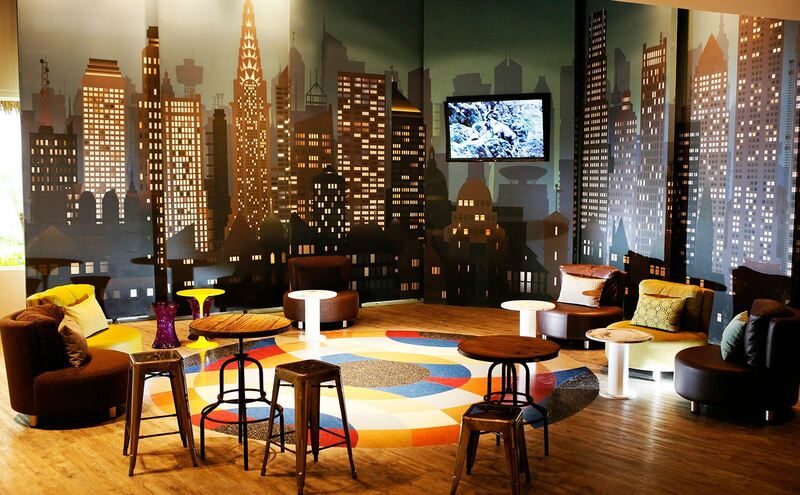 For Teens: the perfect place for kids to chill out in a relaxed environment. Created for ages 13-18, it’s ultra-cool! They can dance the night away (‘till 12:00 PM, that is), or become the next rock star with the karaoke system. Non-alcoholic beverages are the drink de jour and pool tables, ping pong and board games keep the camaraderie going. From 11:00 AM – 12:00 PM, you’ll know where your teens are while they create memories through fun activities in a supervised environment. games and Bingo. They have an opportunity to learn how to make piñatas, kites, masks, jewelry and find amusement in the video area with a theater, X-Box and Wii gaming systems. Daily activities are flexible to fit your children’s age and desires. The Kid’s Club is open every day from 9:00 AM -- 11:00 PM. After that, babysitting is available. For Babies: traveling with babies is much simpler at Grand Velas. 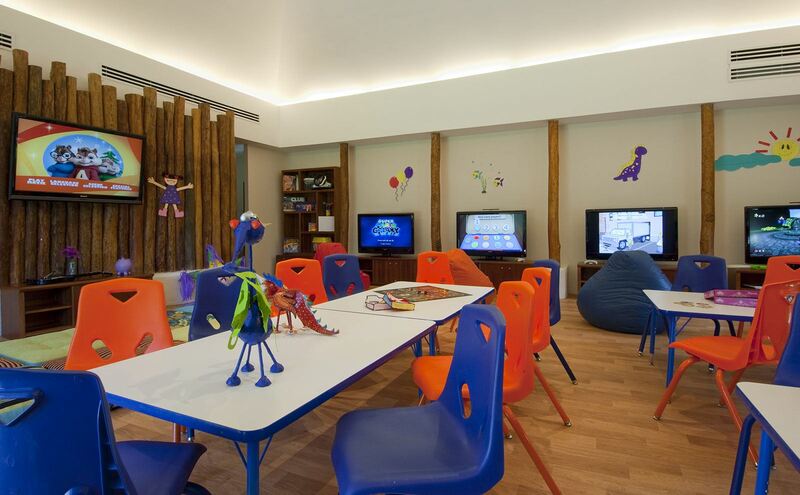 A dedicated Baby Concierge will make arrangements to keep the little ones happy allowing parents to relax in this paradise. A sunrise massage for 1 to 3-year olds is on the agenda enabling the child to recognize the differences between textures and sounds. While your kids are being well-taken care of, you can surrender to blissful rejuvenation at the Grand Velas Spa. The Life Fitness Center is outfitted with state-of-the-art cardio stations with climbers, cross trainers, treadmills and bikes, as well as weight training stations. This tranquil escape features 40 spa suites and a myriad of healing rituals, including massage, body wraps and facials. If that’s not enough, energize your routine with Zumba, Pilates, tai chi and yoga classes and a personal trainer to help you keep focused. 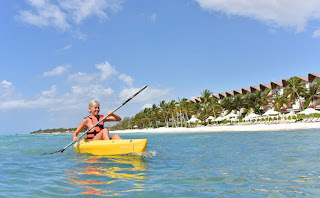 Wait, there’s more: outdoor activities, including kayaks, snorkeling, bicycle tours, water polo, flag football, arts and crafts, sand castle building, scuba diving lessons and fishing trips. You may not want to leave the premises, but the culture of the area beckons with tours to the Mayan jungle and ruins; trips to Xel-Ha, a natural aquarium located on an inlet along the Riviera Maya; Xcaret where you will see turtle nesting sites, manatees, a butterfly pavilion, bat cave, island of jaguars, and orchid greenhouses among the many sites that make up this diverse eco-park; and Xplor a park in the heart of the forest where you can enjoy activities of adventure with the most modern and safest equipment. Travel is an opportunity to be enlightened and as your travel specialist, we can make sure this is true for each member of your group during a family vacation. Give us a call to learn about the exclusive privileges we can provide for you!